So school is back for all kids in the UK now which officially means summer is over. Boo!! Thankfully the weather is still pretty mild here but that means my fussy eater is still shouting for ice cream and popsicles as a post-nursery snack. I made some Strawberry Frozen Yogurt Bark earlier in the summer but this time I wanted to experiment with a lower sugar recipe. Mix the yogurt and honey together until well combined. Add the cranberries and raisins and stir again. Line a baking tray with foil and pour the yogurt mixture on top. Spread it depending on how thick or thin you want your bark to be. Mine was approx 1/2 inch thick. Sprinkle the strawberries, chocolate chips and desiccated coconut on top and place in the freezer for 2-4 hours or until it is completely frozen. Remove from the freezer and use a sharp knife to break the bark into pieces. The bark can be stored in the freezer in food bags. 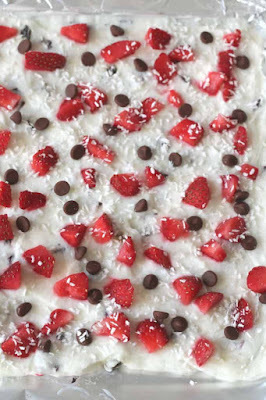 0 Response to "FROZEN YOGURT BARK"